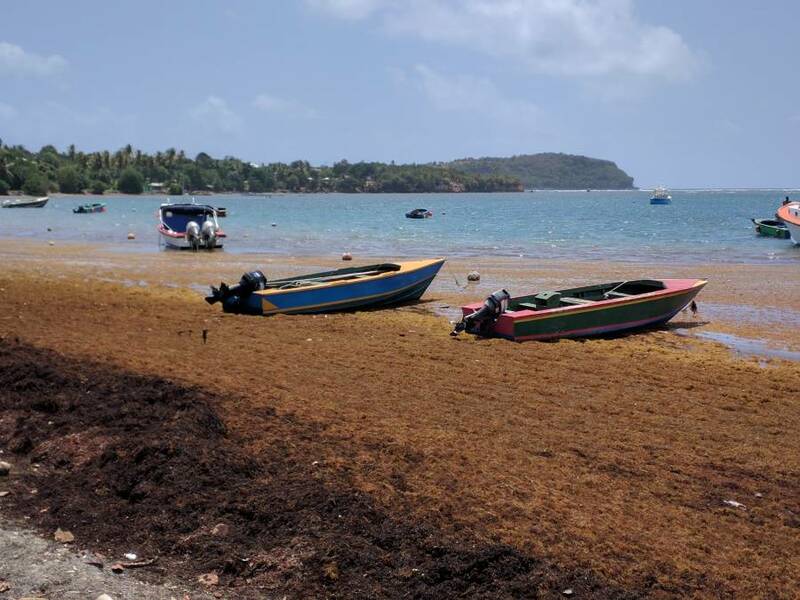 The Ministry of Climate Resilience, the Environment, Forestry, Fisheries, Disaster Management and Information in collaboration with the Ministry of Health will embark on a cleanup action of the sargassum on beaches in Grenada and Carriacou. The sargassum is on various beaches such as Telescope, Soubise, Marquis and Hope in St Andrews, La Sagesse in St David, Windward and Mt Pleasant in Carriacou. Residents are experiencing the adverse impacts of the sargassum because of the noxious odour and general unsightliness. The sargassum is coming from South America where the Orinoco, Amazon and other big rivers are bringing increased nutrients from land to sea, and the warmer nutrient-rich seawater is ideal for the sargassum to grow rapidly. The sargassum is then transported by the waves up to the coastline of the islands and washes up on the bays along the Atlantic shoreline. The cabinet has approved an action plan for the sargassum cleanup which will take place from 9 May to 8 June 2018 in the first instance. The cleanup will be in collaboration with private contractors to accelerate the process. While many persons see the sargassum as waste, it has multiple valuable uses. In Grenada, sargassum is already being used, once rinsed with fresh water, as an organic fertiliser and farmers are reporting excellent results especially with vegetables. Farmers organisations will be engaged in the cleanup process to encourage farmers to use the sargassum. The sargassum will be deposited at Pearls Airport, St Andrews and Mt Hartman, St George for collection. The cabinet has also approved a Sargassum Task Force to oversee the cleanup campaign. For further information: Ministry of Climate Resilience, 3rd Floor Ministerial Complex. Telephone 440-3386.